Ride and Read! NEWS by Madness Photography - Onno "Berserk" Wieringa: National Motorcycle Museum wishes you Happy Holidays! 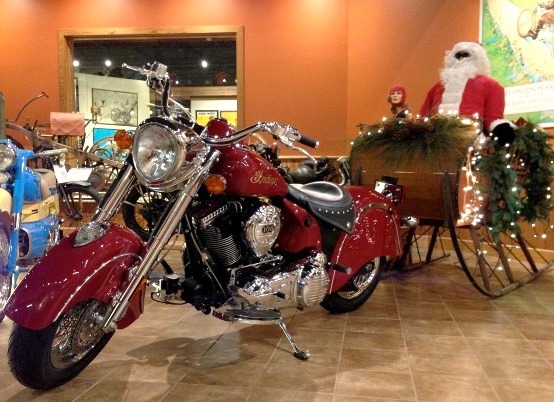 National Motorcycle Museum wishes you Happy Holidays! The holidays are upon us and while we really like this time of year for some family moments, we also remember our extended family, all of you National Motorcycle Museum's supporters and J&P Cycles customers. We've had some great years in this motorcycle world we live in and 2012 was another year to be thankful for. With Museum support growing a bit each year, and knowledge of what we are doing at the Museum spreading, we feel rewarded that visitation is up. It's a measure of approval, you might say, and really does make staff feel good. Our staff has expanded and along with that our ability to do more good things to preserve the history of motorcycling, and let you step into that history here at the new bigger Museum. We're not getting off the throttle for 2013 and hope you'll come by and check out what we've changed and added in the Museum. We do it all for you. Happy Holidays from all of us at the National Motorcycle Museum. Best wishes for more time with friends, family and motorcycling in 2013.